Jim Hackett's latest future-focused speech revolved around the need to share transportation to reduce congestion and pollution. LAS VEGAS -- Ford Motor Co. is expanding its mobility vision from the self-driving car to the cities it expects them to operate in. 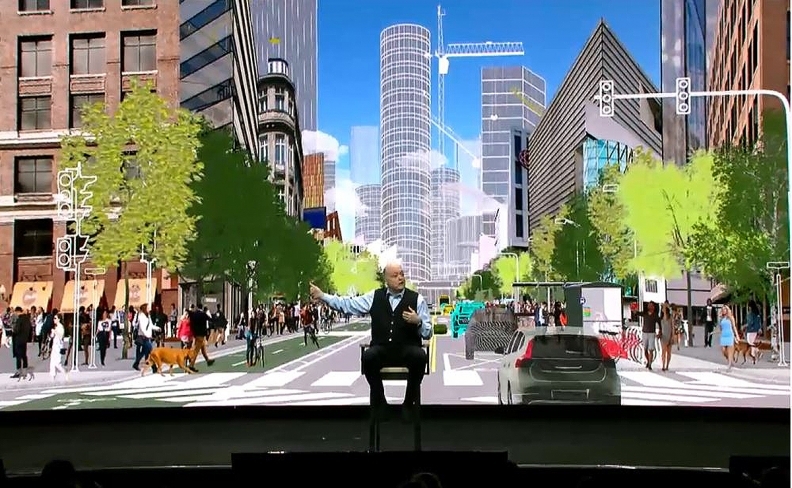 In prepared remarks for his keynote speech Tuesday at CES, Ford CEO Jim Hackett stressed the need for shared transportation and smart infrastructure to improve city functions as technologies such as autonomous driving and connectivity develop. He introduced a swath of partnerships and an autonomous vehicle deployment strategy aimed at addressing these goals. "Technology has developed at the expense of a shared sense of belonging," Hackett said. "It’s time to bring the streets into the sharing economy." Hackett has been gradually outlining his view of future mobility since taking over as CEO last year. In August, he discussed his expectations for a slow ramp-up to fully autonomous vehicles at a Ford mobility event in San Francisco. In an October lecture in Grand Rapids, Mich., the CEO talked about the obstacles to consumer trust. Hackett's latest future-focused speech revolved around the need to share transportation -- using car-sharing, ride-hailing or public transit -- to reduce congestion and pollution. The message of sharing is also a tenet of recent Ford partner Lyft, whose carpooling service now makes up 40 per cent of the ride-hailing company's trips. Ford is also expanding its vehicle-to-infrastructure capabilities, working in collaboration with Autonomic -- a software startup the automaker invested in late last year -- to build a cloud network for vehicles, infrastructure and pedestrians to communicate. Hackett said Ford will also use Qualcomm's recently introduced cellular vehicle-to-everything platform, to enable connectivity with a wide range of other technologies. In March, 2017, Ford announced that it would hire 300 engineers in Ottawa and 100 engineers in the United States. Their focus is infotainment, in-vehicle modems, gateway modules, handset integration, driver assist features and autonomous vehicles.